Extending the range of WiFi devices with antenna to create wireless broadband links can be done several ways. 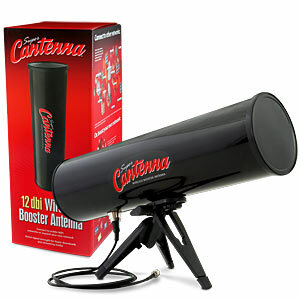 The transmit power of the radio can be increased or an antenna can be used increase the broadcast power over a smaller area. Sometimes we forget that the antenna also increase our listening ability. Sometimes it proves useful to use a larger antenna and reduce the transmit power. This approach enables us to stay within approved guidelines while increasing our receive sensitivity. With the rapid proliferation of public spectrum broadband radios it is becoming increasingly important to limit signal contamination of surrounding areas. 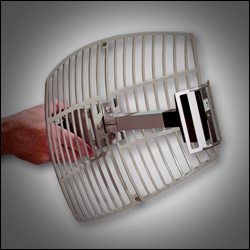 Narrow band antenna are more difficult to align but also have the advantage of improved signal security. There is a lot of information about using antenna on access points. I will try to reference some of the high points and make the process of extending your range a little easier. See commercial solutions at the bottom of this page. Scissors and Glue. 96 Seconds. Double your range and signal strength for about 5 cents! Easy to do with GREAT results! 2:07 minutes. Fairly easy to build yet having excelent parameters. 107 seconds. Fairly easy to build yet having excelent parameters. 2:16 minutes. This is a simple 14dbi WIFI antenna you can make for only 5$. Made from parts you can find very easy. 12:55 minutes. How to use a small satellite dish to create a high gain antenna. " That's all there is to it, folks -- you now have a dish with 27-31 dBi of gain and negligable sidelobe radiation (<40dB). The beamwidth is about 4 degrees." "This page is referenced because it shows photos of many of the connectors." 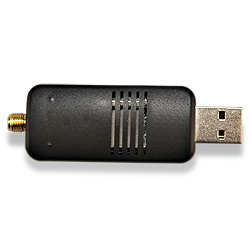 Versa WiFi USB Adapter has an external connector that lets you connect another better antenna -- and more than triple your wireless range. Installer for Windows, Mac, and Linux. 802.11b/g. Works at speeds up to 54 Mbps. WPA and WEP encryption compatible. 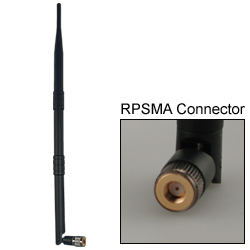 Super USB WiFi Antenna Chipset Gain: Up to 20dBm, Antenna Gain: 4.5dBi. Plugs into USB. Installer for Windows, Mac, and Linux. 802.11b/g. Works at speeds up to 54 Mbps. WPA and WEP encryption compatible. Point To Point Parabolic WiFi Antenna Antenna Gain: 15dBi. 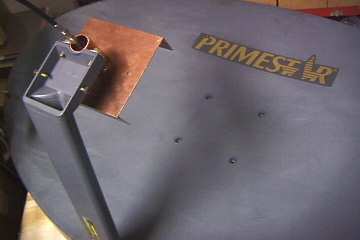 For point to point applications over distances up to three miles line of sight. Can be used with Versa WiFi USB Adapter. Can be used with various routers, page also lists ultra-low-loss coaxial cable and cable adapters. RPSMA Male x N Female, RPSMA Male x N Male, RPTNC Male x Female. 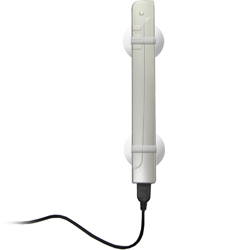 Hi-Gain 7dBi WiFi Antenna 2.4 GHz omni-directional antenna is lightweight and well made. Choose between RPSMA male or RPTNC male connector type.